about the Kingdom of Peace? Hazrat Isa al Masih (Jesus) is recognized by people of all religions as one who has promoted peace with his words and deeds and who has brought much peace to the world. 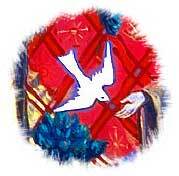 A man once painted a picture of a man with a sword in one hand and a dove in the other. When asked if he could paint a picture of a man holding a dove of peace with both hands, he replied, "I would have to paint a portrait of Jesus". Though we don't know if he ever began this second painting, his words stand out as a testimony to Hazrat Isa's life of peace. 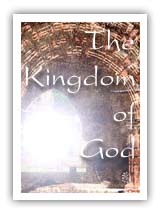 When Hazrat Isa lived on this earth, he came teaching about the Kingdom--the Kingdom of God. This kingdom does not divide along political, ethnic, sectarian or even humanly drawn religious lines. It is the Kingdom of God. You can't look around and say with total accuracy that this person is in the kingdom and this person is not. Therefore we cannot say that the West is in God's kingdom and the East is not; nor can we say that the East is in God's kingdom and the West is not. Yes, there are indications about who is in the kingdom, but the kingdom of God is a kingdom whose total membership is only known to God. Each member of that kingdom is ultimately answerable to God. As a result many leaders today have been fearful of him. In Hazrat Isa's day the religious leaders were fearful and angry at him; the political leaders were fearful and angry at him. Yet, he brought peace of heart to the humble and repentant. But it didn't stop there. Even the proud, arrogant and unrepentant were affected by his life. The Bible also gives the same description of people who belong to God's true kingdom. But are these actions unique to the teachings of Hazrat Isa? How exactly do the teachings of Hazrat Isa promote peace? First, entrance into God's kingdom brings personal peace for the individual. Hazrat Isa taught that the way one gets into the kingdom is by admitting from his or her heart and lips that he or she don't deserve entrance into the kingdom and by believing and following the way God has given to get entrance into his kingdom. The reason why Hazrat Isa said we don't deserve entrance into the kingdom is because of the fact that every human falls short of God's standard of perfection and sinlessness. Some people may challenge that. But who can say they have never told a lie, stolen even a small item, or looked with lust at another person. Even our own conscience tells us when we break God's standard. Many don't believe there is any one standard to which God holds them. Others hold strongly to one standard. Yet, they all condemn themselves by criticizing others for failing to live by their standard, written or unwritten, while they themselves fail to keep the same standard. When he first entered the kingdom of God, he was possessed by a great love toward his fellow human beings, especially one individual who had been unkind to him and many others. The reason why he was possessed with this love was because he was full of the knowledge of the love of God toward him. For a short time he had been aware that he was a sinful being and therefore separated from God. He didn't know what to do about this. A couple of religious people had given him their advice but in the end he sensed he should simply express to God the need he felt in his heart. Having done that, he sensed a peace that he had been honest with God. He also sensed that God heard and cared. Obviously, he knew this much about God. Only an hour or two later he was struck with a strong sense of his sin. Verses from the Holy Bible came to his mind. He simply agreed with God in his heart and mind about his sins--falling short of God's requirement of perfection--toward God and other human beings. He realized these acts separated him from God, not simply his fellow human beings. Then he was reminded of the words of the Holy Bible that spoke of God's love for him--how God had sent Jesus Christ to come and die in his place to ransom him from eternity separated from God in hell. He acknowledged this to be true. At that very moment he realized he was no longer separated from God. He had the witness of God in his heart that he was included in God's family--God's kingdom. The very next day he saw another person struggling with a heavy load. Suddenly a thought came to mind, "Why don't you go help him?" to which he responded in his heart, "Why should I? He's been mean to me all week long." Immediately another thought came, "But didn't Jesus Christ love you when you didn't deserve it?" To that he could not reply. The only way to be true to God and himself was to help the person. He did this out of respect to God and found great joy in the process. Love had conquered. The love of God received had stimulated love for others. ...but he also asks us to love our neighbour also (which is again quite easy to do seeing that our neighbours may help us in return when we are in a difficult position). But even further, he asks us to love our enemies, not those whom we hate but those who hate us and who we might be tempted to hate. This is much more difficult to do. Hazrat Isa did this from a personal position devoid of political or economic power or the possibility of selfish human influence. He also died for the cause of peace. Because he refused to cause harm to others or encourage his followers to harm others, he willingly gave up his life even when accused unjustly. Are Hazrat Isa's followers doing this today? Many people who claim to be his followers are not doing this today because they really aren't his followers. Others simply don't realize the promises that God gives to those who follow the message he gave to Hazrat Isa. They fail to realize that when they give up their own selfish power, God's power is seen. As a result God is praised, remembered and glorified, but the people involved realize they have seen the work of God and they sense his real presence. Therefore they fulfill the purpose for which God put them here on earth--to experience God in truth. It is the sense of God's presence that brings repentance and the power to live a life pleasing to him. Furthermore, to my knowledge, Hazrat Isa is unique in this. By giving up his very life, he gave the greatest expression of love that any man can give, setting the greatest example of peace and love for others. Because he knew he was at peace with God, and he was without sin and therefore acceptable to God, Hazrat Isa willingly went to the cross to pay the debt we all owe to God for breaking his law. As Hazrat Isa took his final breaths on the cross, he said the Greek word "tetelestai", literally meaning "it is finished" or "the debt has been cancelled." He was the ransom, the payment, for all who choose to believe on him past, present and future! And in his resurrection three days later, Hazrat Isa cleared the way for the greatest power for an actual life of love. The only thing that keeps us out of God's kingdom is sin--failing to match up to his standard of perfection. The just result of sin is death and death is the greatest enemy and greatest fear for the common man. When love is required, the follower of Hazrat Isa has an example that causes him to love to the point of death, not dying in physical aggression toward others but dying if necessary because he chose to live in peace with his fellow man. But in that example he has the assurance that death is not the end, that as Hazrat Isa rose from the dead, he too will rise to eternity with God on the Day of Resurrection. These very facts cause anger in the hearts of some people. Some are jealous of the peace they see in the followers of Hazrat Isa, yet they don't have the faith in God and the courage to join them. Others have been taught that these facts are wrong. However, the true follower of Hazrat Isa presses on knowing that he must follow the truth that he has experienced, proving the way of peace. there is no longer a need to earn God's favour, but instead there is rejoicing in God's favour. There is no fear of death because acceptance has already been granted by God. There is no need for anger towards others for "keeping them from performing their religion" because God is in ultimate control and has taken the initiative to bring acceptance in the first place. There is also no need for competition to be "better" than the next person because one's acceptance is with the God who knows every thought and deed. One's acceptance is not from humanly designed political, economical, sectarian, or religious groups. Societies that have truly embraced Hazrat Isa's teachings and experienced God's peace, have been affected in mass by the example of those who live out these truths. They have not only provided a good place for themselves to live but have also shown love on those who have not chosen this way of peace. In light of the present circumstances in our world today, the teachings of Hazrat Isa need to be seriously considered. He taught that each person must deal with his own faults before he tries to sort out the faults of others. The lack of peace in this world is many times a result of the fact that as human beings we have a wrong view of power and God's favour. When Hazrat Isa lived on this earth, he had compassion on the people that were straying from God's path. We see that he had the right sense of power and assurance of God's favour because he maintained that compassion to his (not their) own death and God rewarded him greatly. The gospel of Hazrat Isa is the gospel of peace because it strikes at the root of pride, jealousy, envy and greed, which are named in the Holy Bible as some of the worst sins. These are the sins that are listed right alongside sexual immorality. God himself, through the Hazrat Musa (Moses), warned his followers in the following admonition about the dangers of abhorring the evil that others do while smugly thinking that everything is right in their own lives. In the following passage God warns the man who despises idolatry and is among those who have gained victory over the idolaters to realize this, if his individual heart is not right with God he too will come under the anger and curse of God. Christians: Are most Muslims terrorists? In recent years we have seen the result of terrorists who believe they have the right to kill those who displease God and are attached to symbols of wealth and wickedness, thinking all the while that they are doing what is right. Yet they fail to take the beam out of their own eye before they try to root the speck out of another person's eye. On the other hand, many of the victims of the terrorists feel they have been robbed of their rights and seek revenge. They too, are looking at the speck in the other person's eye before taking out the beam in their own eye. In this time, it is important that each person look to the truth that God has revealed to him about how to live in peace in this world. As I write, I am praying this prayer myself. God doesn't always reveal these things in a moment. But it is my desire that as local communities and as a worldwide community we might all do this. That is why I write these things here. Then together as fellow human beings from various ethnic backgrounds, we will set an example of holiness and avoid any fulfillment of the famous proverb, "Advice for others; himself, a man of disgrace." May we encourage one another in these things and follow the way God has revealed to live in peace in this world. Content supplied, in majority, by the "Isa Tandoor" Web site. Used with permission.